March 20, 2017 54 Comments This post may contain affiliate links. This spring table has a few elements you can steal for spring or Easter decorating ideas. Like a chicken wire cloche or newspaper nest. Nothing cost much and most of it you already have! 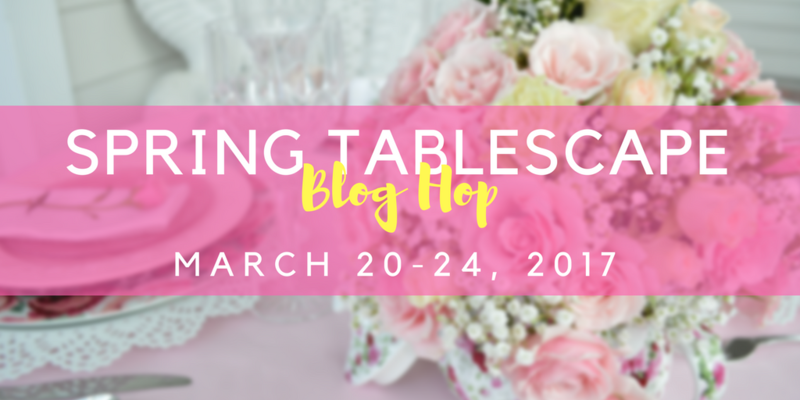 What’s even more inspiring about today’s post is the fact that it comes with extra ideas as part of a Spring tablescape blog hop. You will get a chance to visit some lovely ladies and their creative ideas all week long! This February I was invited to visit the New York Headquarters for the website Hometalk (a great DIY site I frequently contribute to). While there I met Chloe from the blog Celebrate & Decorate, she invited me to join along with her fun tablescape party. Chloe was a bright light for me. I was really struggling at the time about this blog, Chloe was so excited and energized about what she is doing the feeling became contagious. The whole trip was an inspiring special time for me. It helped me realize how much I love sharing with you all and what a privilege it is to be a creative maker! 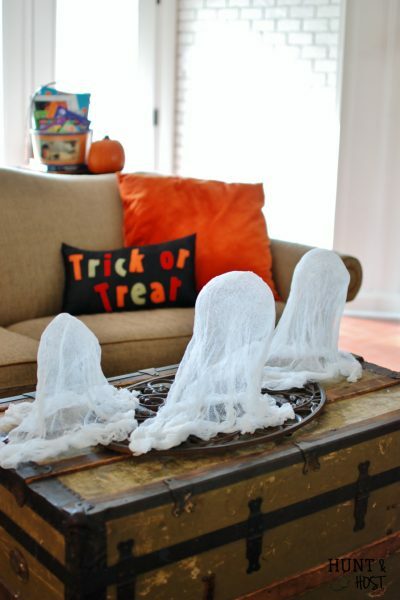 All the mush aside here are the decorating ideas you came for! Chicken wire was on my “must use soon” list and spring screams chicken wire! Being a lover of any and every cloche I thought a chicken wire cloche would be super fun. I’m not gonna lie, I have a love hate relationship with this project. I love the way it turned out, but working with the pokey wire just about did me in, at least until I figured out exactly what I was doing. Hopefully this tutorial will save you the scrapes and pokes I mustered through! Tip #1: use gloves! Bind the overlap together with the small length of wire. Connect in three places. Close to the top, bottom and middle of the tube. Gently bend the top until it forms a dome and the tips of the sides touch. You will need to play with it a little and bend the wire to get it just how you like it (see two pics back). *affiliate links, this just means if you make a purchase I may get a small commission, thank you! I finished mine off by threading some ripped fabric through the holes around the top and tying a bow. It would be really cute with a wooden ball glued on top or maybe even a pom pom. For the bird’s nest I started with mismatched glasses I snagged at a thrift store for a quarter each. 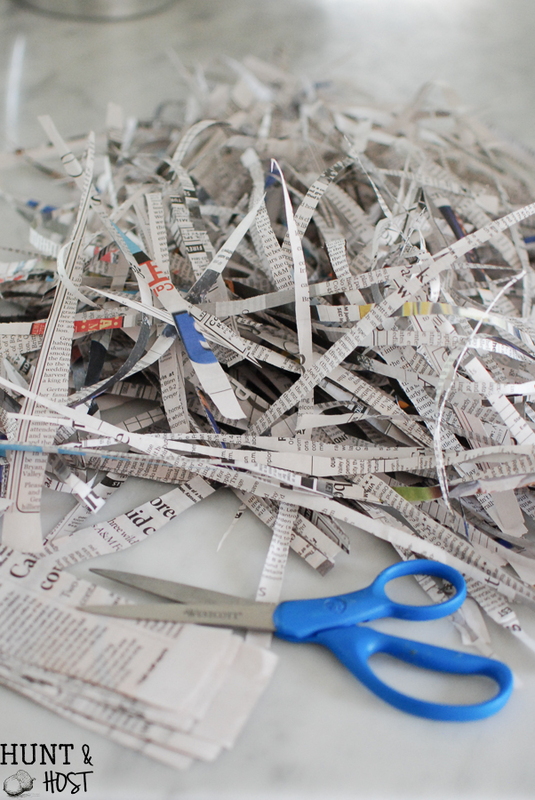 Next get your old newspaper out and cut it into thin strips. Gently wrap a handful of newspaper strips around your hand in a circle and softly place in the cup. Then I stained some wooden eggs from a craft store, they were three for $1. 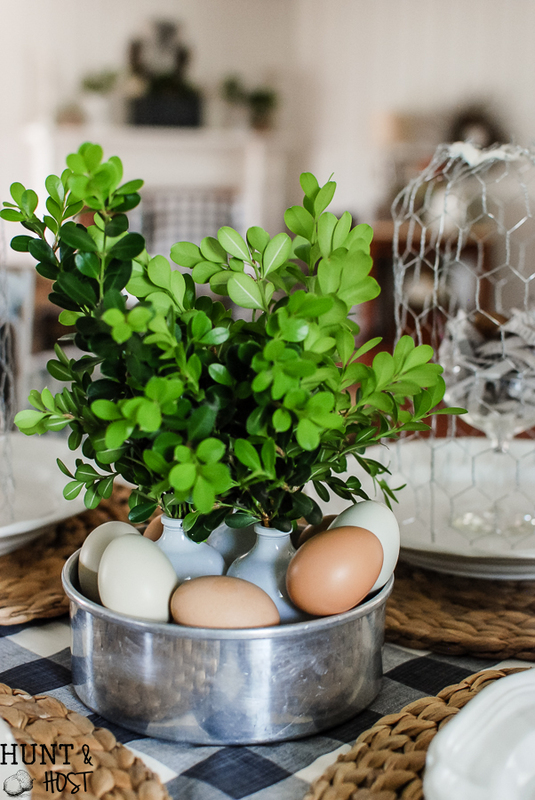 Arrange your egg in the middle and cover with your chicken wire cloche. 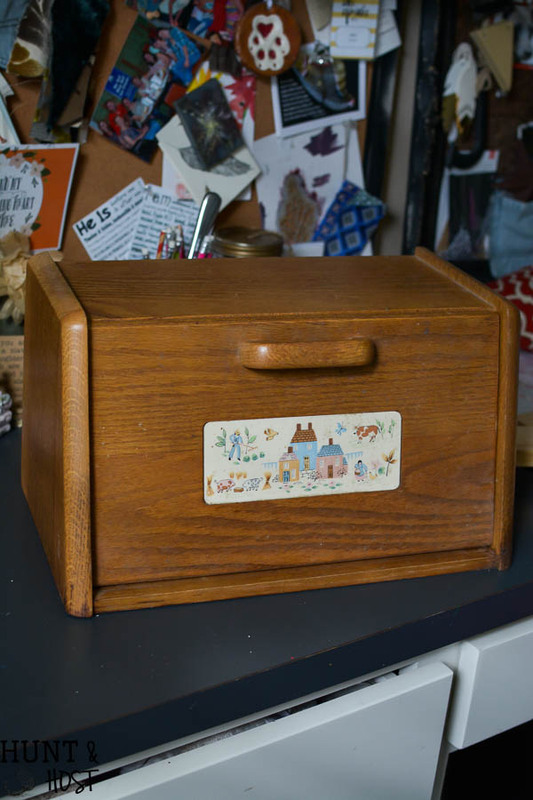 You could make one for decorating or eight for a pretty tablescape. For my centerpiece I went with my old faithful…greenery from the yard. Beautiful, in season and FREE! Three small bud vases hold a few snips of boxwood, pushed together they look grand. I surrounded them with hen eggs that have had the yolks blown out. You can see the rest of my spring décor here and here. It doesn’t take much to bring a fun table together, use what you have and add one new thing this year to change it up a little. 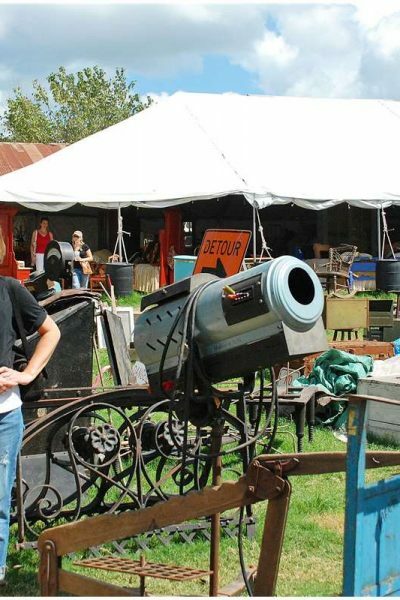 Hopefully these projects will spark a new idea for you. Be sure to head over and see more inspiration from my friends below. Check back all week as new ideas are rolled out every day. Thanks for stopping by and have a wonderful week! Thanks Pam, this has been a beautiful week for sure! Nice to meet you, Kim. 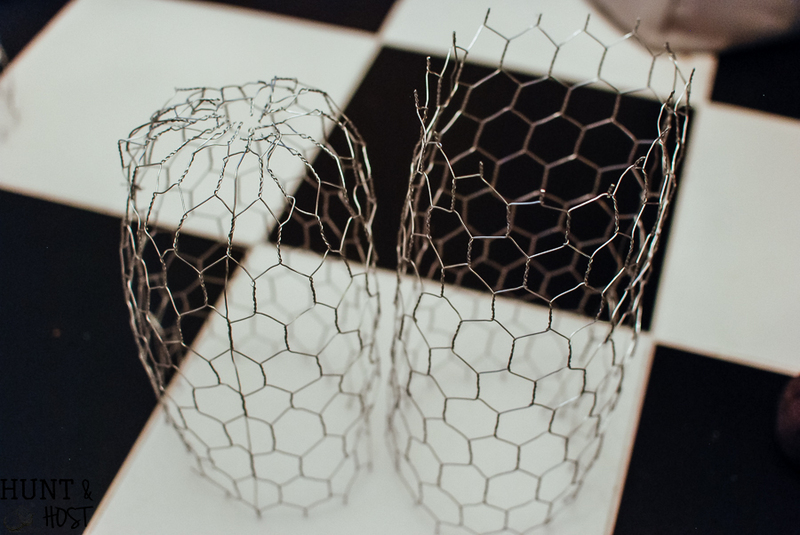 Love your creative chicken wire cloches. Thanks for the tutorial. 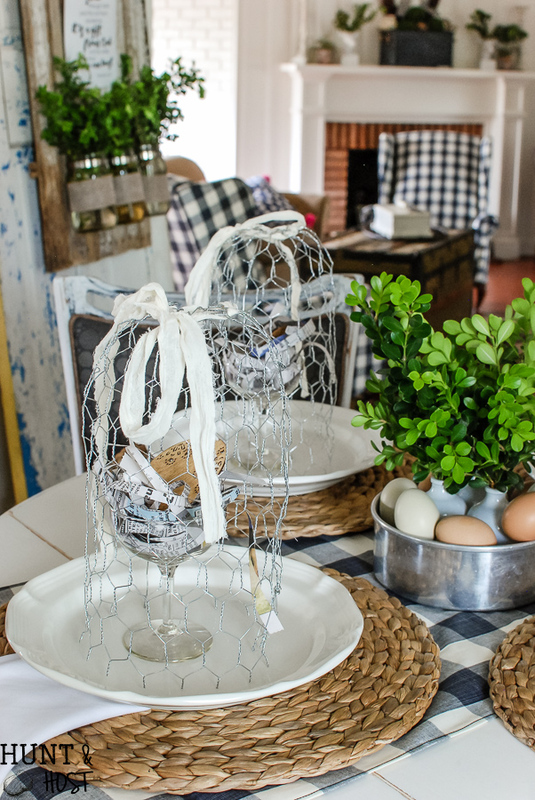 The boxwood and egg centerpiece is the crowning touch and the check runner completes your great look.Glad you joined the blog hop. Thank you Bonnie, I am a sucker for those chicken eggs, can’t beat nature! Kim, you do farmhouse style very well. I love your spring table, and what a fabulous cloche/nest tutorial with thrifty (and thrifted!) items. Happy Spring. Will do – and thanks so much! 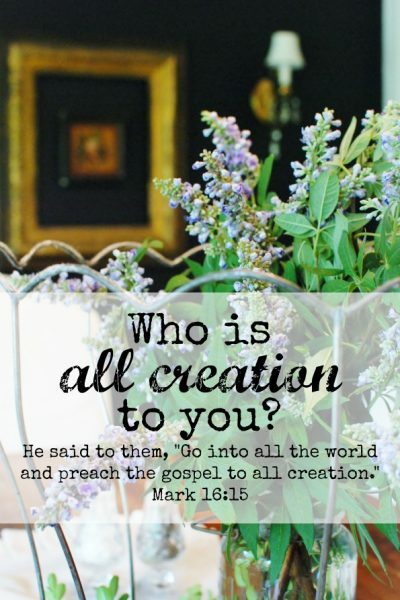 Thank you for joining the blog hop! The chicken wire cloche is very unique idea. Thanks, I am was so happy to be invited. Hi, Kim! It is so nice to meet you and have the chance to blog hop with you this week. Your Spring table is so pretty and looks perfect with your farmhouse style. 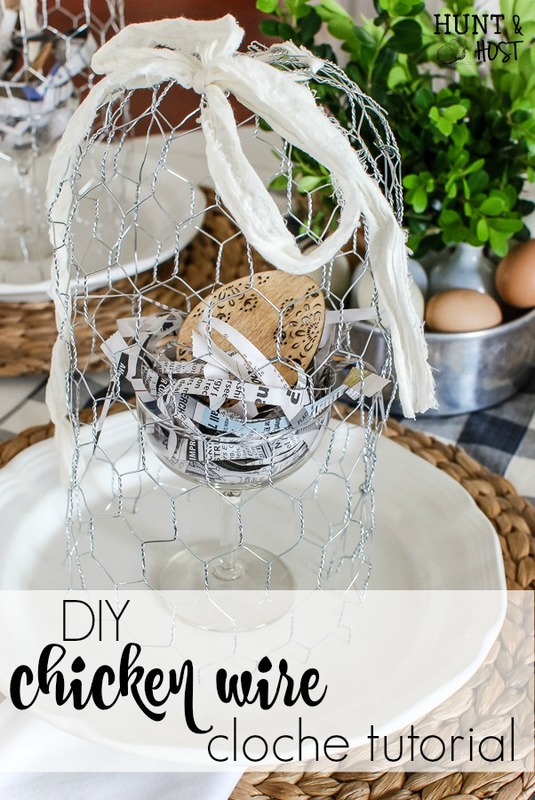 I love the chicken wire cloches with sweet bird’s nest…such a wonderful idea! Happy first day of Spring!!! Thank you Shannon, Everyone did a fabulous job this week! Kim, your farmhouse table is fun. I’m not a DYI person much now, but your tutorial for the cloches would inspire me if I were. It looks like a fun project and makes a great detail for the table. Happy Spring! Well glass cloches are gorgeous too and popular in the stores, they would look wonderful on a spring table too! Hello Kim, a pleasure to meet you and participate in the blog hop with you. The cloche is a darling idea. Truly a lovely farmhouse tablescape. Love your added tutorial. Happy Spring. Could I love this anymore? I don’t think so! I mean seriously LOVE. I wish I could have been at the bloggers meeting and got in on that conversation. Kim, I am so glad to have met you in New York and so VERY happy that you joined the blog hop! 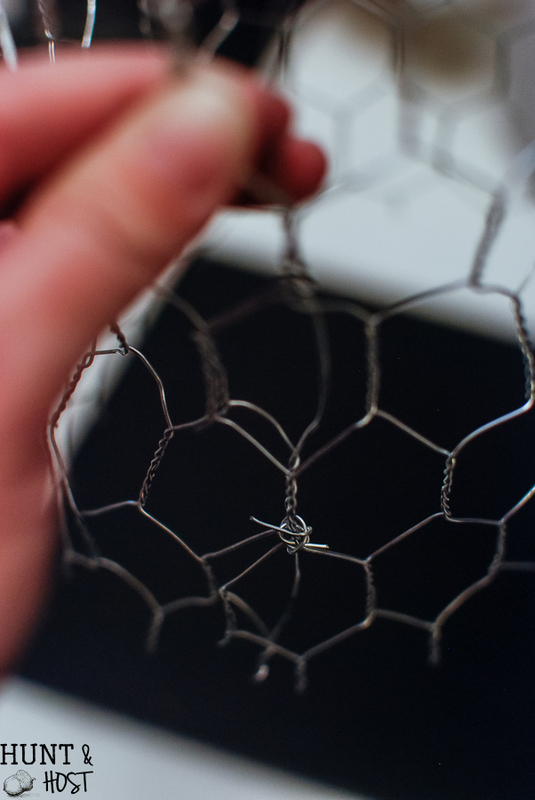 Your chicken wire cloches are so adorable! I love this idea! 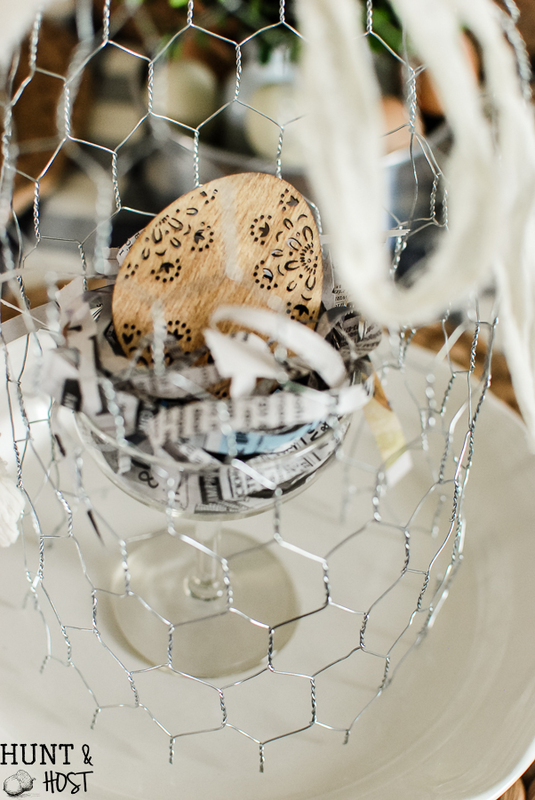 The rustic feel of the chicken wire along with your shredded newspaper ‘nests’ are a perfect combination! 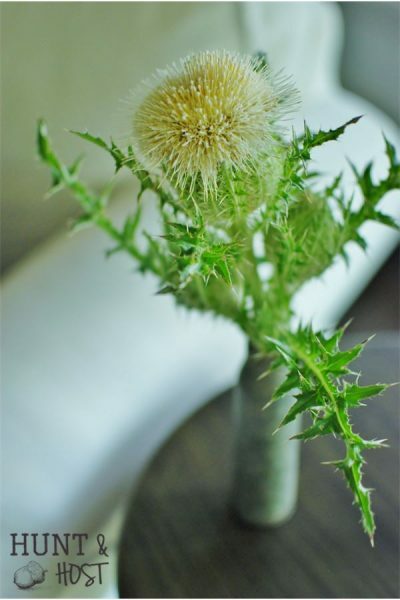 Having plants outside you can snip from is ideal for adding that pop of greenery to your table! Thank you so much for connecting! Let’s stay in touch! It has been a great group of ladies, so glad you joined in Michelle! love this idea. They could also be used to cover tender little plants in my garden,when they first start coming up and the wind blows them. Thanks Kim and have a great day. That is a sweet idea, I think they could probably find multiple uses around the house! Cute idea for a farm-fresh table. Kim, a chicken wire cloche! How original and creative. Not to mention so precious. I remember meeting you at lunch at Haven last year. Hope to see you again. So happy to be on the spring tablescape hop with her. What a beautiful table. The wire basket is perfect for outdoors too. Love the black and white plaid. Pefect for Spring. Thanks, it would be great for outdoor décor! It is so nice to meet you. What a pretty and fun idea and how perfect for anyone that loves farmhouse and rustic style. The wire cloche is genius. Inexpensive, organic and fresh. And I also like the monogrammed napkins. It adds a touch of rustic elegance to the table. 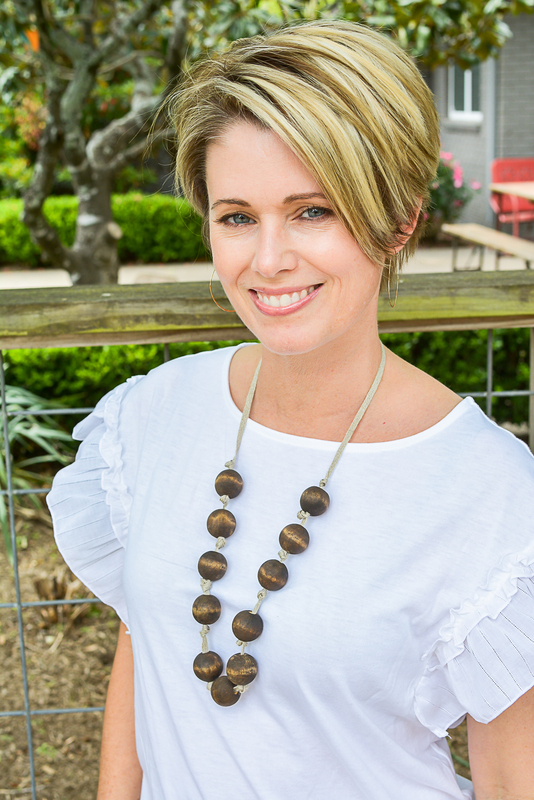 Looking forward to blog hopping with you this week! Thank you so much , I love to use inexpensive items, it makes it more enjoyable for me. Such a fun hop to be on! 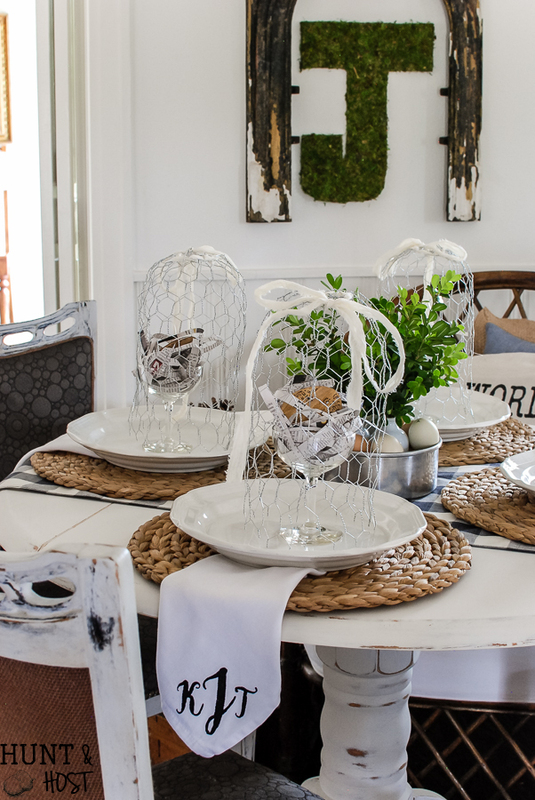 The wire cloches are such a unique and farmhouse-y idea and look great on your spring table. I really like the rustic look of them and that you did such a fantastic job of creating a tablescape using what you had. 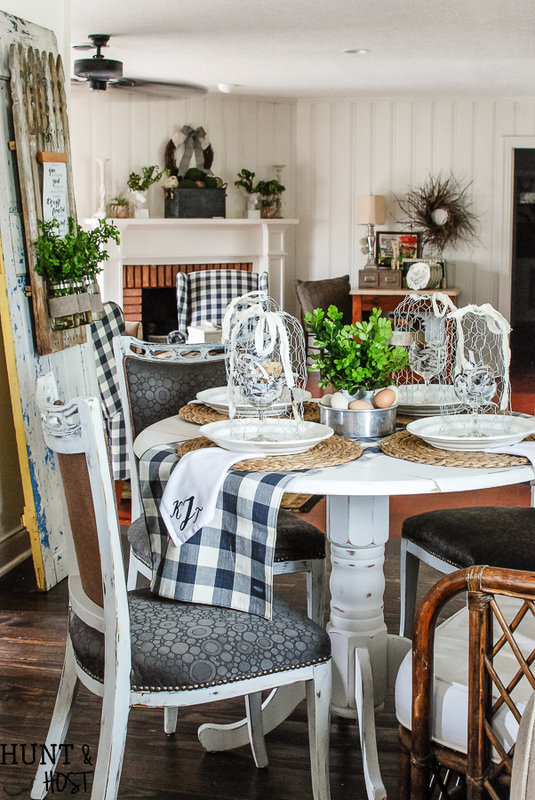 I am a big fan of black/white buffalo check so I love your table runner and those chairs I see in the background. Happy Spring! Your table setting (and room) and photography are beautiful!! I just love all the textures and layers in your styling. Great DIY! Pinned. Thank you so much for sharing Kathryn, I appreciate it so much. All the tables are wonderful, love seeing everyone’s creativity expressed! 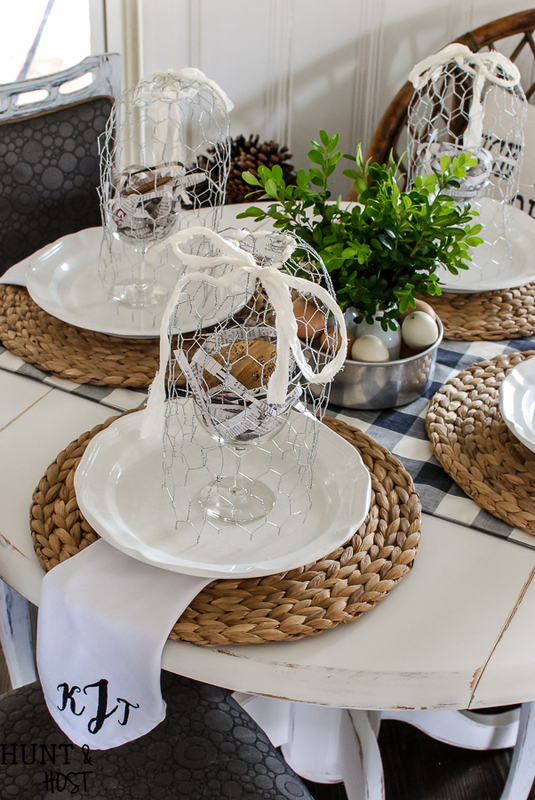 my favorite part of this tablescape are your napkins!……Might just have make some like that for myself! Thanks They are pretty easy to do, need to get a tutorial up on the blog! Hope you makes some, you will love them. lol – grammar is not my best friend, I would say cloches. so glad you like them! beautiful little cloches! 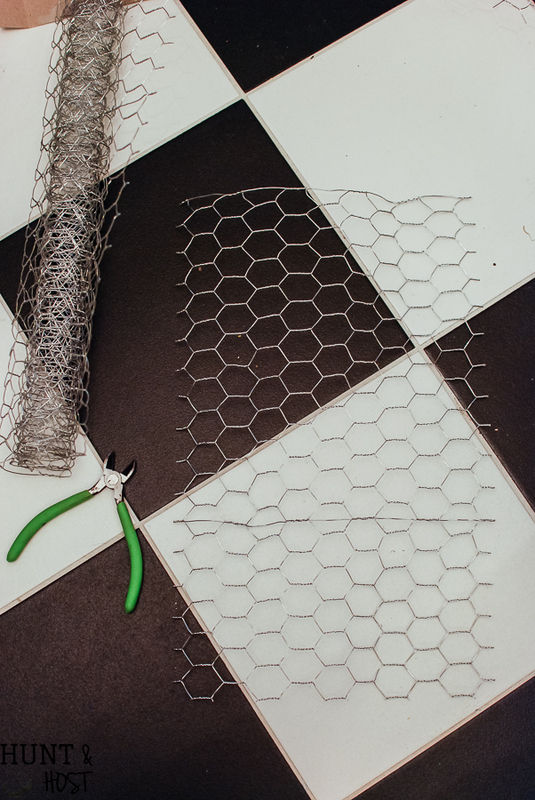 I would have never thought to use chicken wire! Thanks Ariel, I appreciate it! What a fun DIY! We’ve had a roll of chicken wire in our garage for at least four years and I’m so happy I didn’t toss it. You are very creative and your table looks very inviting. Put those left overs to work! I have started thinking of other fun ways to use what’s left on my roll now that I lived through this project, lol! Love what you’ve done with the chicken wire. Your constructions have certainly given me an idea for birdhouse display. that sounds fun and beautiful!!! Oh gosh! Love your table and love the DIY! Chicken Wire is one of my favorite things. ???? Looks beautiful! thank you – it’s a fun thing to work with for sure. Love the table scape…thanks for sharing! So glad you like it, hope it gives you some fun ideas!